As shockingly as she often behaves, its swiftly evident that there is something oddly addictive about Pearl, not only for her companions, but for us readers as well. Only her best and most secret friend, a little skeleton girl, truly garners Pearl’s respect, while her outright adoration is reserved solely for her glamorous father. As Pearl’s mother grows increasingly unstable, we’re treated to other extremes in Pearl’s character, as well as an unexpected protectiveness towards The Blob. When adolescence hits, Pearl’s fragility begins to gleam through, entwining with a core of inner strength that is all about survival. In fact, despite the darkness that glimmers from within this fiercely self-sufficient girl, it’s clear that she is not, as her mother would have us believe, a bad child, but merely a person determinedly uncovering all the possibilities that her life can contain. 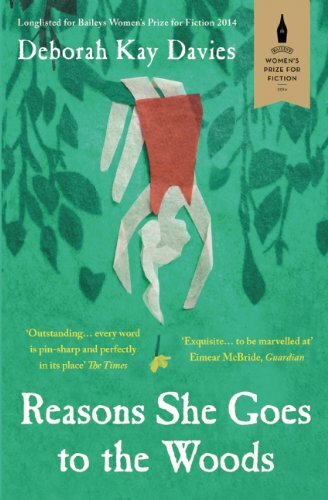 Reasons She Goes to the Woods by Deborah Kay Davies is published by Oneworld Publications and is available to buy from Amazon. This entry was posted in Reviews and tagged Book reviews, Deborah Kay Davies, Reasons She Goes To The Woods by Judy. Bookmark the permalink.